The Juicy series continues to prove a runaway hit for the 3 Ravens brewing team and they keep on coming up with new versions of their hazy IPA to satisfy eager mouths. It's not just new versions of the beer either, as they've been working on the recipe over time too. Some changes to the malt bill, including raising the amount of oats in the mix, plus a reduced bitterness and the addition of more dry-hopping have contributed to beers that are softer and fuller than the earliest iterations. For Simcoe Juicy, they dry-hopped the beer four times and, while the US variety's ability to produce piney and earthy characters might lead one to expect a result a far cry from its predecessors, anything on the pine front remains very much in the background. 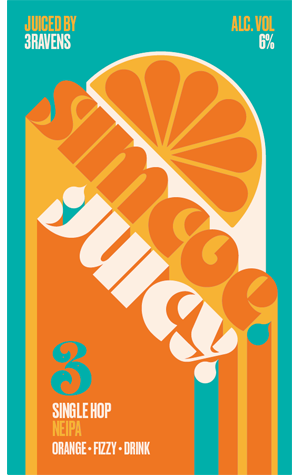 Instead, they've squeezed as much of Simcoe's citrusy and breakfast juicy side from those late additions to create another thoroughly enjoyable addition to the canon.